The Senior Little League East Champions — formerly known as the KAU Knights — made up of players from the Kennett and Unionville area, take part in Saturday night’s opening ceremonies for the Senior Little League World Series. BANGOR, Maine — They are no longer the KAU Kings, at least for this week. 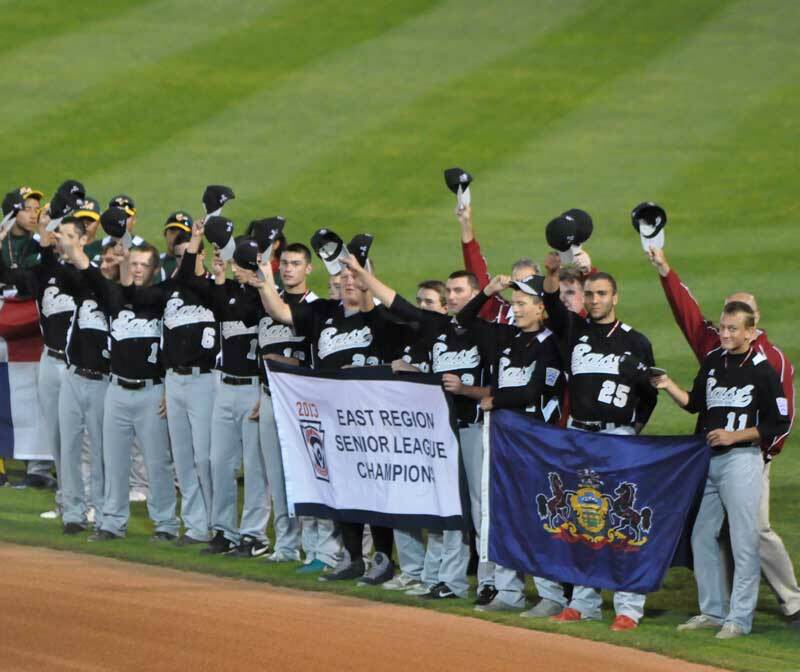 The squad of Kennett and Unionville-area under-16 baseball players now have formally adopted the mantle of East Champions of the Senior Little League, and have new black, white and gray uniforms to prove it. After a weather delayed 12-hour bus ride Friday, the East team settled into the headquarters hotel late Friday, and had a light workout Saturday ahead of its Sunday evening opener against Laredo, Texas. Saturday evening, though, was all about celebration, as all 10 teams in the tournament gathered with fans, friends and family at Mansfield Stadium, Saturday night. There were fireworks, a parade of teams and a celebration of the 10 teams — out of 72,000 worldwide — that reached the pinnacle of Senior League Baseball. Saturday was also an opportunity for the players on the teams to get to know a bit about each other, trade some pins (the local kids had Mushroom Capital pins from Bove Jewelers, some from the Phillies and of course their state, regional and sectional pins to trade) and learn about places outside of the country. While they had a few tales to tell about a rain-soaked drive north Friday, they couldn’t compare to the travel stories of the Canadian and Hawaiian teams, both of which have basically been on a three-week road trip. As one might expect in feeding 10 teams of hungry teens, the food tents ere a busy place, as the teams chowed down on steak and seafood Newburg for dinner. The atmosphere is, well, a bit intense. Getting some of the ceremony out of the way — a day before actual play starts — is probably a good thing, Pechin said. With a day under their belts, East should be able to buckle down and get ready to face the Southwest Champs. Not much is known about them, but they appear to thrive on pitching, speed and defense. NOTES: The East team is monitoring the internet to follow the progress of their District 28 neighbors, the Lionville Little Leaguers, in the Mid-Atlantic Region of the Little League World Series, and as on Sunday morning, were one win of making it to the World Series in Williamsport. “Obviously we’re hoping they make it to the World Series, too,” said Pechin. Despite heavy rains, Mansfield Stadium is in top shape — and appears to be a top-flight facility, the coaches say. The stadium was built in 1991 with funding provided by best-selling author Stephen King. The stadium is dedicated to Shawn Trevor Mansfield a family friend of Stephen King who died after a long fight with cerebal palsy before he had a chance to play America’s pastime. King’s home is behind a grove of trees in right field. He has been known to stop by on occasion to watch a game. Aside from the aesthetic beauty of this stadium and first class drainage, this looks very much like a Major League field with dimensions of 330 down the lines, 375 in the alleys, and 405 to center field, according coach Chris Jarmuz, who offered a scouting report on the field. 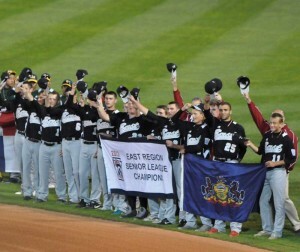 On a related note, since the SLWS has been hosted in Bangor in 2002, more than 1,300 players went on to play professionally, with seven making it to the major leagues including Mets’ shortstop Ruben Tejada and and Phillies’ outfielder Domonic Brown. They won 4-2 tonight. They play Italy tomorrow at 10 am. Such a great experience!